From childhood, Elder Kevin Read Duncan was eager to serve the Lord as a missionary. “I was never, ever on the fence. I always knew I wanted to serve a mission,” he says. Well before his 19th birthday, Elder Duncan happened to meet a General Authority serving in the Missionary Department who challenged him to memorize the missionary discussions. He met that challenge and was later called to the Chile Santiago South Mission. His time as a missionary reconfirmed his love for serving the Lord. “I knew I wanted to be a missionary every day of the rest of my life,” says Elder Duncan. Elder Duncan, born in October 1960, is the son of David Henry and LaRene Eliza Duncan. He grew up on a family farm in West Point, Utah. Living on the farm as a boy taught him not only to work, he says, but also to love to work. That work ethic helped him earn from Brigham Young University a bachelor’s degree in accounting, a master’s degree in accounting taxation, and a juris doctorate in law. He started his career as a tax attorney and later founded a corporation in litigation technology. Elder Duncan and his wife, Nancy Elizabeth Smart, were married on June 27, 1986, in the Salt Lake Temple. They are parents of five children, including one with Elder Duncan’s first wife, the late Wendy Wallentine. Nearly 20 years after serving a mission in Chile, Elder Duncan returned on a Church-service mission as associate international legal counsel for the Church in South America. While there, he was called to preside over the Chile Santiago North Mission, living in the same mission home where he had served as a young man. 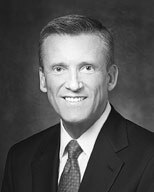 Prior to his call to the First Quorum of the Seventy, Elder Duncan served as a bishop’s counselor, ward mission leader, high councilor, and Area Seventy in the Utah South Area.